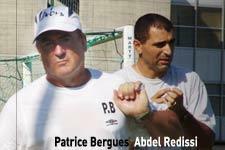 While acknowledging that “the first few days of pre-season training are a little tough,” Patrice Bergues is delighted by the “good work” and the fact that the players have “worked hard over the holidays and followed Robert Duverne’s program.” Confirming the assistant coach’s praise, Jérémy Clément and François Clerc lead the charge during a timed endurance run, despite the challenging conditions. “The heat is our main problem at present,” said Bergues. Confident in the progression of his team, the Créteil native was in optimistic mood: “Like last season, i twill be a five-week pre-season program. We know what to do, and now we just have to do it.” While the squad occupies itself primarily with physical work initially, Bergues outlines the coming weeks: “It’s not just a matter if getting everyone into shape. There’s obviously some technical work to be achieved in circulating the ball to be ready for the season.” Afternoon training is based on exercises about conserving possession of the ball.